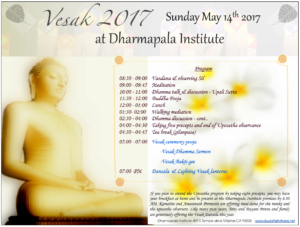 Dharmapala Institute warmly invites you to participate at the annual Vesak celebration on Sunday May 14th 2017. We have the pleasure of having Vnenerable Thapovane Sutadhara thero from southern California to conduct the Vesak Uposatha program. Please download two (part 1 and part 2) mp3 files for a discussion of the sutta by Ven. Bikkhu Bodhi from the following link. You may have to download and save the files before listening. 02:30 – 04:00 Dhamma discussion – cont..
We encourage all our members to participate at the Vesak program as their time permits, and make use of this event to strengthen your own dhamma practice. 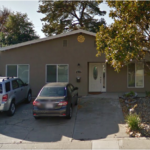 You may feel free to join the meditation sessions and dhamma discussion forums at any time of day. If you plan to attend the uposatha observance Day, you may have your breakfast at home and be present at the Dharmapala Institute premises by 8.30 AM. Kamalini and Amaranath Premasiri are offering the meal-dana for the Uposatha program. At the end of the day we will be having the Vesak ceremony pooja, Vesak Bakti Gee and Vesak dansela followed by the lighting of Vesak lanterns. Tony and Dayani Perera and family are generously offering the ‘Vesak Dansela’. We would like to remind all the children to bring a Vesak lantern, and encourage parents to teach and help children to build Vesak Lanterns and make this event colorful. 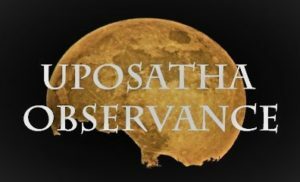 Next story Poson Uposatha Observance – Sunday June 4th !! !